Welcome to NYC LIT! An immense Hip Hop library by sample supremo Vinnie Zummo containing over 1000 samples of pure originality. NYC LIT sees the return of New York producer Vinnie Zummo (NY Cutz, Escape From The Planet Of The Breaks, Droppin Like It’s Hot, and Kocktail Kollection) to the hip hop beat-making world. The beats and sounds on this awesome library seem to hark back to retro flavored sounds you may think you have heard before yet they come out as something entirely new. They would not sound out of place on something by Kanye, Pusha-T, or Drake. 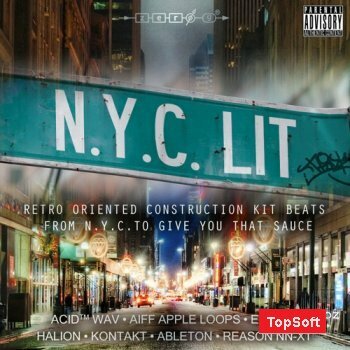 NYC LIT contains over 28 construction kits with titles like Diamonds Beat, Son Of Salty, Dab Beat. There are also independent sections titled Atmospheres, Breakdowns, Dark Percussed-son, Drumloops, Fills, Guitars, Moods, Seasoning Small Drum Loops, and tons of sounds for you to use as salt and pepper in your beats. Vinnie has dipped into an extensive, personal collection of never-released vintage tracks to save you from having to do any crate-digging. So if you want to add sounds that skitter from quirky comic book spirit to bottom-heavy, filthy acid trip beats and beyond then NYC LIT is the way to go. These grinding grooves are on fire!!! If you are into genuine, unique Hip Hop NYC LIT has everything you need to create raw and original urban music, the way it was meant to be. Straight outta New York. All of the samples have been pre-cleared and are 100% original & royalty-free for your musical use without any additional licensing fees!